As it gets cold outside, I start getting quilting fever. Of course, it doesn’t help that my friend Jackie is always quilting and sending me these awesome photos of the quilts she is currently working on. Thanks, for sharing your wonderful quilts with me, Jac! So when I get catalogs in the mail that have pretty quilts in them, I never want to buy them, I want to make them. Now the thing with quilting is that it takes FOREVER to put one together. At least the ones that I have done in the past have been seriously timely affairs. So I have chosen a coverlet size to tackle this time so that I get quicker results. That doesn’t mean I will have a quilt to cuddle under next week but maybe by February. I receive catalogs from a company called Garnet Hill and I saved one of them with this simple design. So Sunday night, after painting on Jan’s cows most of the day, I went to the fabric stash. Quilters have a saying that “the one that dies with the most fabric, wins”. I think Jackie is way ahead of me there but I have a pretty good assortment. The key, I think is to rarely throw any of them away because you can still cut a section out and use it, especially for a quilt like this one that has lots of different patterns. So this is about a 4′ x 5′ size coverlet with a black fabric as the background and I had to cut out a total of 96 circles for the pattern on top. I used a Pyrex lid for my pattern and simply drew the circles on the fabric and started cutting. I love the way it looks. It is so colorful and in the winter months will be a happy quilt to sit under. Each of the circles will have to be hemmed and then appliqued to the top. This is a similar technique that I did on the quilt that I did for Thomas. My plan then, was to make each of the boys a quilt for their high school graduations. Of course,neither got finished until they were almost finished with college. Thomas had requested a black quilt. We compromised and put black in it and lots of color on the interior. The border on this one is appliqued and has a vine that runs around the edge with fan-like flowers on the vine. I think it turned into a quilt that he will cherish for years to come and it is also a very happy quilt. Over the years, I have made many quilts for friends and family and you can see more of them here at our family website. For awhile, I was doing baby quilts for my co-workers and one year there were so many babies born that I was wondering if they had it in for me. I finally had to resort to pillows. John’s quilt took on a more nature theme. He is a forestry guy so I found a quilt on the web that I really liked but had to draw out the pattern because there wasn’t one available. The quilt shop in Staunton, VA, Rachel’s Quilt Patch had these wonderful batik fabrics and the lady helped me to choose them for the pattern. The border on this quilt has appliqued trees, frogs and fish. I think it will be good to do a simple quilt now and not take on something so complicated. Belle has chosen orange and teal for her wedding colors are and I absolutely love them. I mean, orange is just so happy (laughing orange) and the teal is a cool color. So, I am putting them into the party that we are doing for them on September the 24th wherever I can. Rather than try to find accessories to fit that color scheme, I thought it would be fun to make the parts to the party myself. I have purchased some things in those colors and in the coming weeks I will share some of those items with you but for today I am going to share the beautiful tablecloths that I am making to put on the banquet tables in the yard. With Herb’s help we are trying a “how to video” posting today, so please bear with us. a flat sheet or large piece of fabric. I used flat sheets that I found at a discount store. Although it seems they are harder to find these days due to sheets packaged as sets. paints. 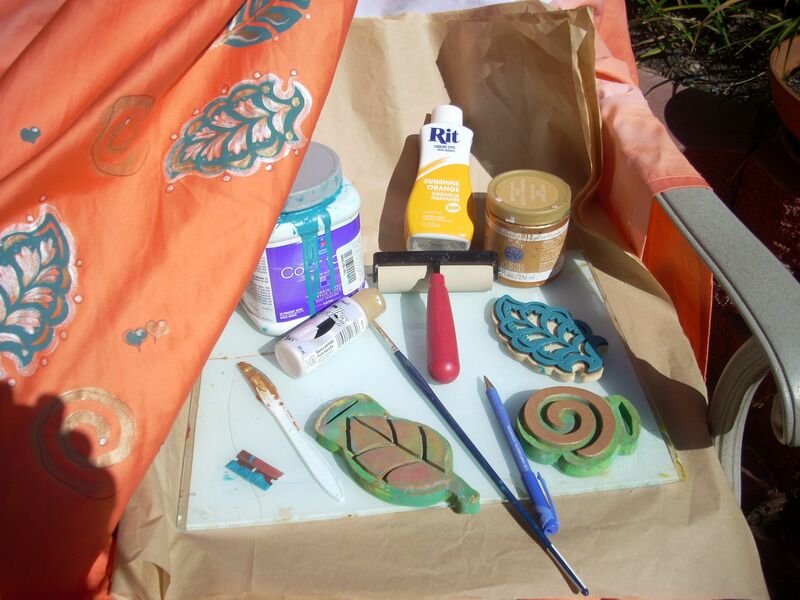 I used an assortment, a latex house type paint, a wall glaze and an acrylic. 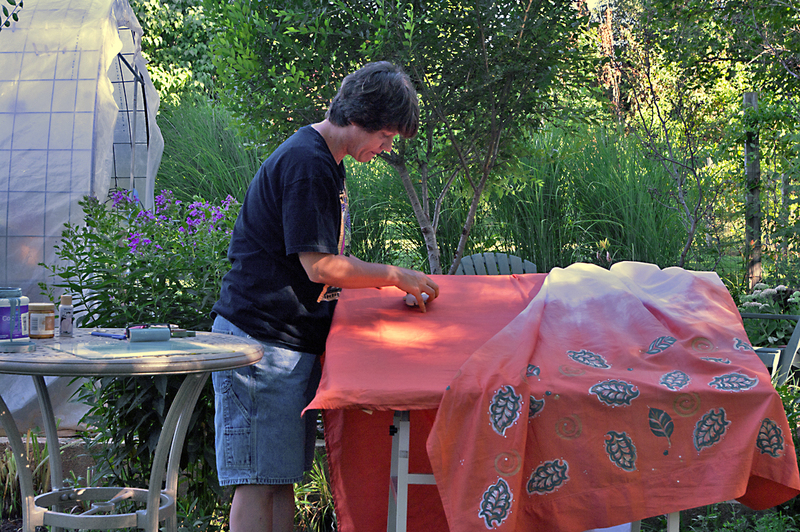 This first video will give you an idea or how to get the orange dye onto the fabric so that the color vignettes from color to white. And in this next video, I will demonstrate how to stamp the patterns onto the fabric using a printmaking brayer and paint. And finally, I demonstrate how to add the details to the stamped design so that it looks more handmade and give the design more character rather than a boring stamp. A little glitter and shine make it look elegant and special. I bought a new product to do glaze resist on my pottery. 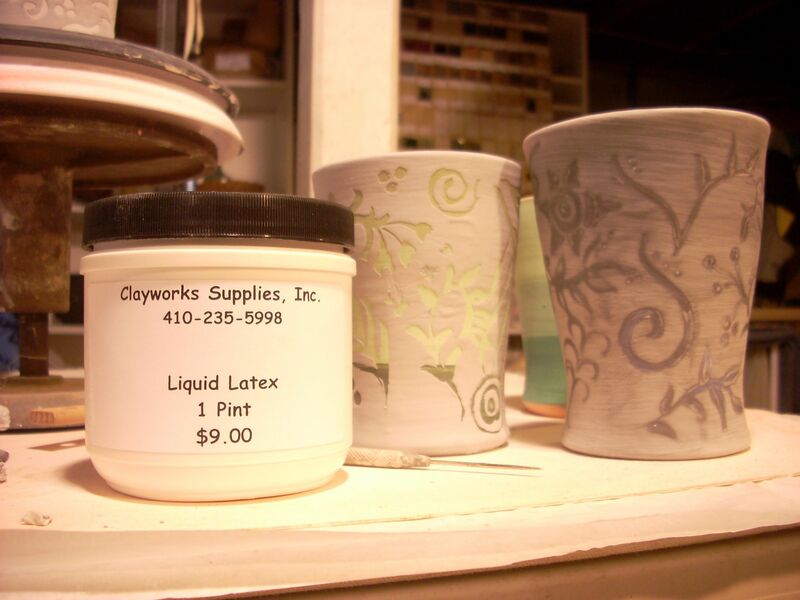 The water based wax that I have has not really been working out for me so I thought I would try this latex glaze resist. As you can see in the photo it comes in a pint sized jar and is probably a year’s worth of product. I was really skeptical as to how it works on the bisque ware but I am posting to share what I discovered this morning and I am psyched. So far, I am really pleased with how easy it works. 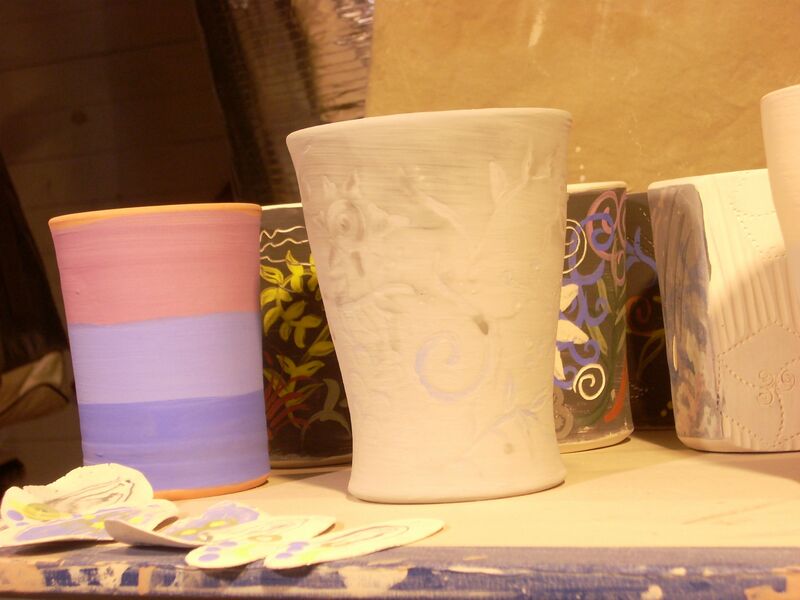 The bisque ware was underglazed with bands of underglaze in color families. 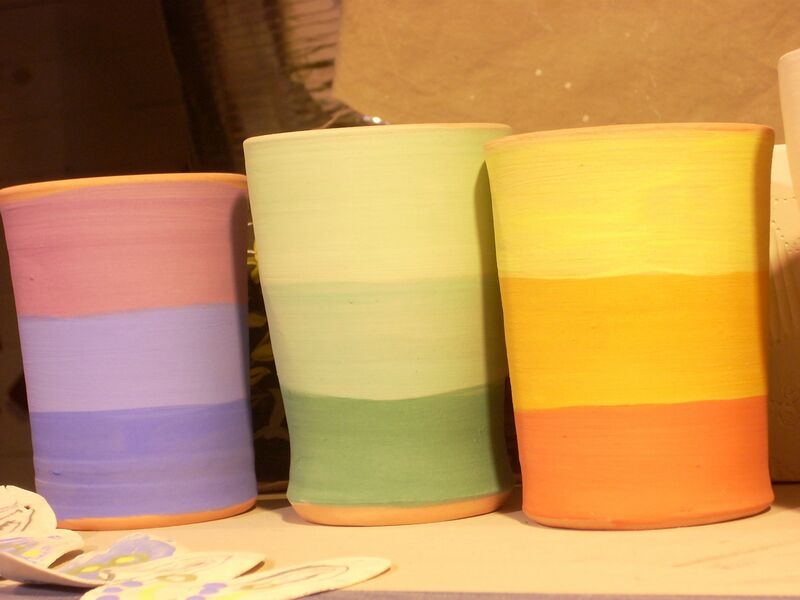 A blue, an orange, a green and a gray with the intent to do a resist design on the tumbler and then glaze the outside with a glossy black so that the matte finish design will show through with the colors gradating down the side of the pot. 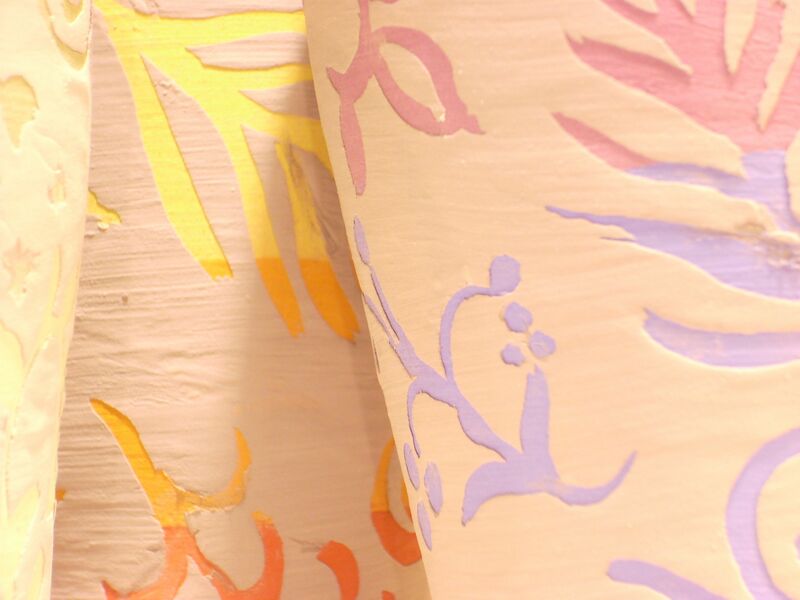 The wax resist is applied onto the bands in the viney plant design and let dry. Some of them I let dry overnight and others I just gave them a few minutes. I couldn’t tell that it really made a difference in the peel off step. Then the black glaze was applied in three coats with a large brush. This is allowed to dry and then using a needle tool I pierced the glaze and pricked the latex. I give a bit of a tug and the glaze comes off just as the brush had applied the design, having the same feel of fluency that I had hoped it would have. Very cool! 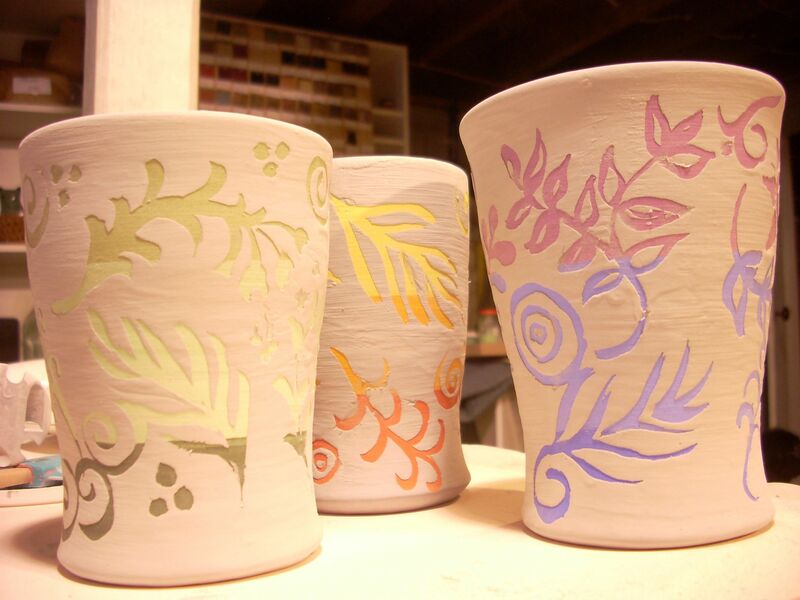 Then you see the overall design with the underglaze showing through on these finished, well almost finished, tumblers. I want to do a white interior and then they will be done. 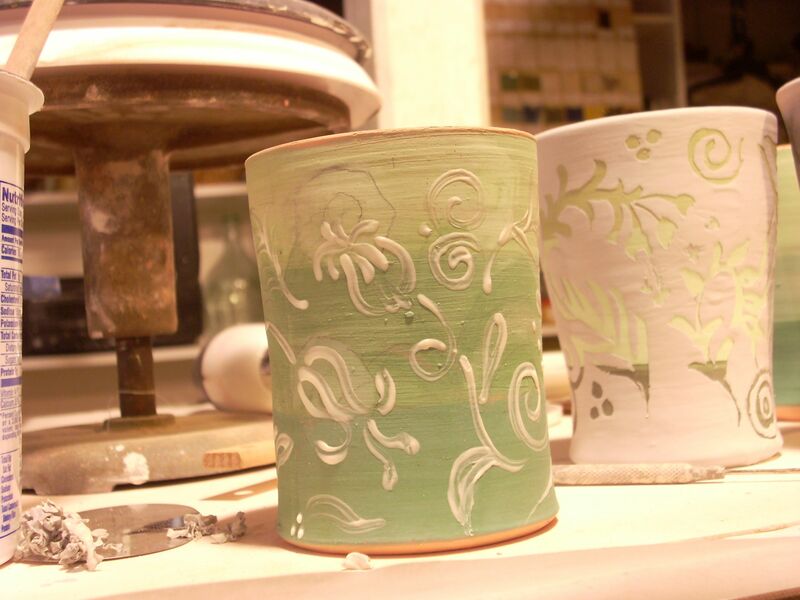 I will post again after the glaze firing so we can see how this is going to work out. My little studio is in my basement for now and in order to get things organized so that I can be productive and creative I am going through my glazes and making a test tile of all of them so I know what I have and what I need to order. I have a board with nails on it that I have used in the past to put my test/sample tiles on but recently it got knocked down and all the tiles broke. This is probably a good thing in disguise because now all my test tiles will be all the same size and I will have a more thorough system. I have to get the glaze out of the container, which sometimes requires a hammer and a screwdriver to break it up first, and then I have to crush the brick into a powdery substance and then mix it with water. Additionally, I run the mixture through a sieve so that all the parts combine and mix really well. 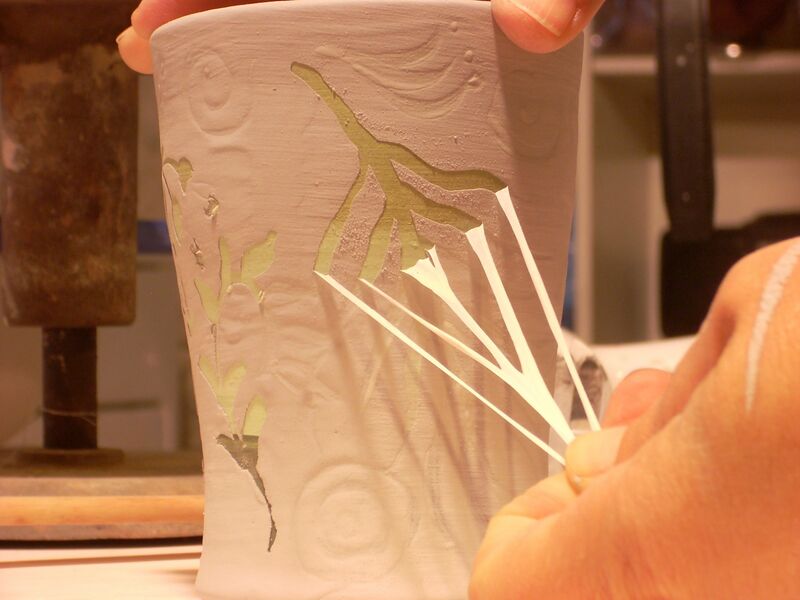 Then, I coat the test tile with the glaze in three strokes so that I have a thin and a thick version of the glaze. This helps me to determine how heavy to coat a glaze onto a finished piece. The glaze is put on the side without the label and then I will hang these onto the board with the nails in it and put it in a place that it won’t get knocked off. I have several old bookcases down in the basement, perhaps I can hinge it to the bookcase that contains all the glazes.